Ford Suffers Carpal Tunnel from Too Much Emailing | The Gettysburgian. 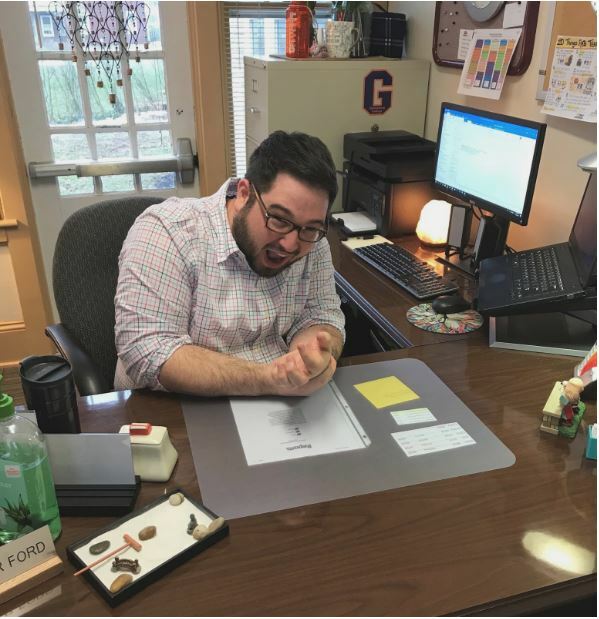 The Center for Career Development’s own Christopher Ford, Career Counselor and Coordinator of Marketing, was diagnosed earlier this week with a severe case of carpal tunnel in both of his wrists. Students might best recognize Ford from their Outlook inboxes, where his name has appeared again and again (and again) next to emails about upcoming career opportunities. Ford’s tireless dedication to keeping students informed about every externship and internship and job fair and networking event and informational session occuring on- and off-campus has taken a heavy toll on Ford’s physical health. According to the prognosis provided by a medical professional, Ford suffers from carpal tunnel syndrome in both his right and left wrists. Tacked onto every email, this helpful note only added stress to the building tension in Ford’s wrists from his steady, unending, bordering excessive output of emails every week. Despite medical professionals urging Ford to consider surgery in order to relieve the pain more fully, Ford allegedly did not hear their recommendation, as he was too busy typing his second email in less than an hour about an upcoming workshop on the practical and innumerable uses of LinkedIn. GettyLeeks wishes Ford a speedy recovery and the students of Gettysburg College the best of luck with their email inboxes.